And just when you thought I couldn’t do anything more with Modern Medley, out pops a Pumpkin Pie offering! Okay, I’ll own up now. I played and made 11 Modern Medley cards all following the same basic style, but looking totally different….! So, you’re just going to have to get used to the fact that I’m going to be battering your computer monitors/tablets/phones for the next few weeks with a Modern Medley card every few days. Okay, I’m not sorry. I LOVE THIS PAPER!!!!! Oh I love the versatility, the styles, the way it melds with other colours *whispers* the sexiness of some of them….! But this card today is one I made for my husband. 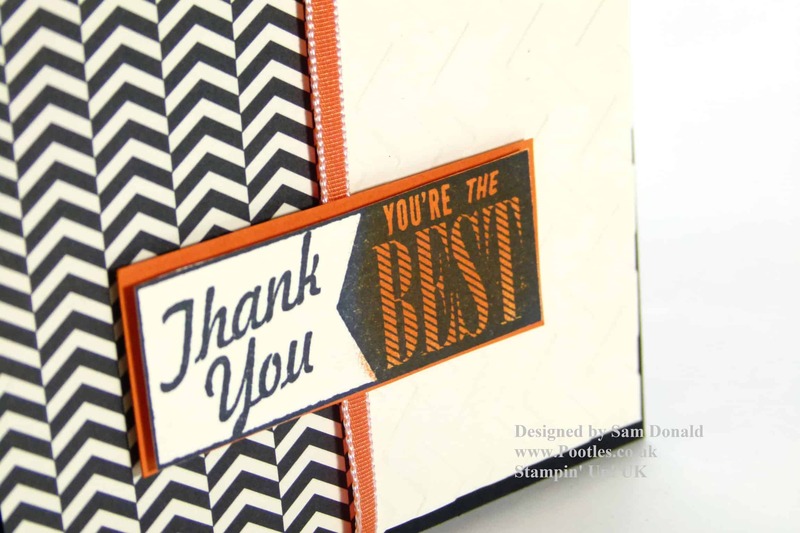 I made him one a while back also with Modern Medley, and with a sentiment from the same Hello, Lovely stamp set, but this just seems to look so different! 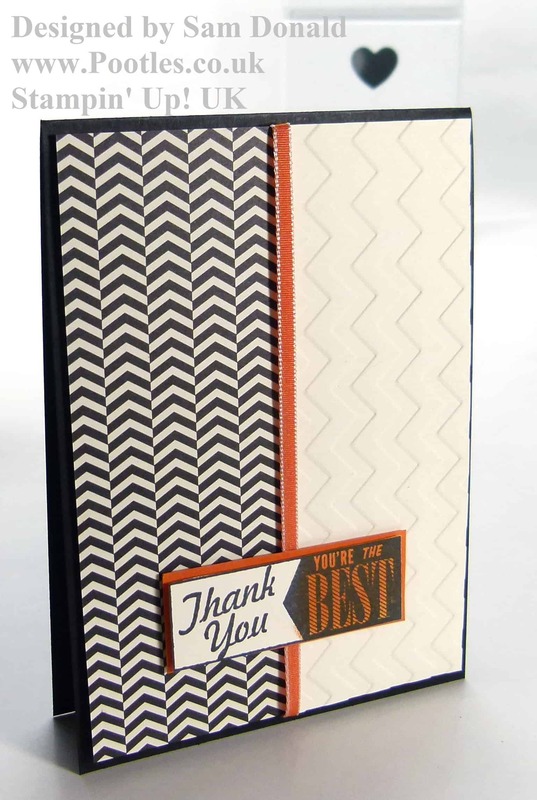 Perhaps it’s the Chevron Textured Embossing that has done it? I decided on the Pumpkin Pie, because it just seemed the most ‘manly’ skinny ribbon I had, and because I was working to a theme for these papers, I wanted to keep it but without the easy option of the Black Taffeta I used a few days ago on the Daffodil Delight card. I hope you like it, although more importantly, I hope he likes it. The card I made him back at the beginning of August still sits on our kitchen windowsill, and there’s room for this one too! So for no other reason than I think he’s the best, this card is manly enough for even the most hardened biker…!